Protect your Agglomeration Drums from corrosion, wear, and expensive maintenance. Thanks to the confidence placed on us by our Customers, we have developed extensive experience in the rubber lining of Agglomeration Drums for Mining Operations worldwide. 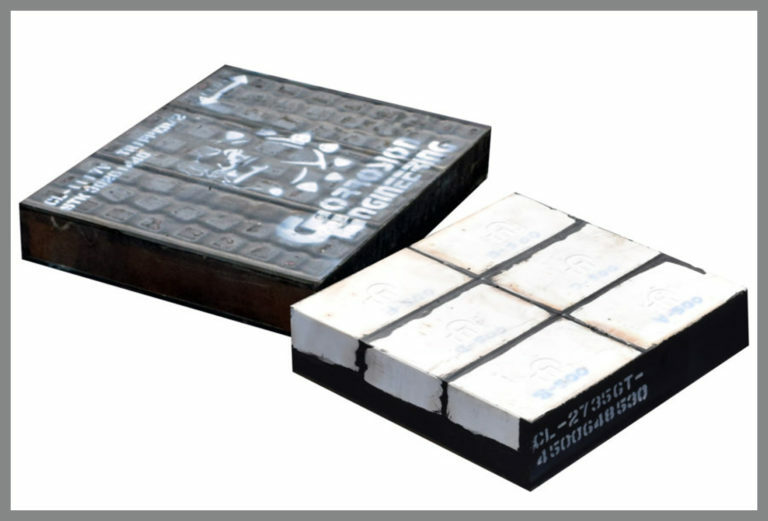 Several fixing methods for Liners and Lifters have been designed based on the operational conditions of each particular drum. These fixing methods are oriented to minimize maintenance shutdowns and extend wear life. Agglomerating drums are expensive, heavy-duty leaching units highly important in mining and minerals processing operations. With the high costs of owning and operating agglomeration drums, it is important to protect and maximize operating life and productivity in every aspect of the operation. Corrosion Engineering has developed a unique drum lining system that minimizes maintenance shutdowns and creates the highest possible wear life for drums to reduce overall costs. Corrosion Engineering’s unique drum lining system combines a vulcanize-bonded protective barrier directly on the surface of the drum with replaceable wear-resistant rubber or rubber/ceramic plates and lifters. This system effectively eliminates the problem of corrosion from the highly acidic environment while providing optimal wear protection to maximize service life. The wear life of a conventional lining system is generally around 6 to 12 months, with 3 to 6 weeks shutdown time required to replace these linings. In comparison, Corrosion Engineering’s drum lining systems last 4 to 6 years, with 2 days maximum shutdown time required to replace. Corrosion Engineering has developed many unique attachment systems that do not require penetrating the drum, with all attachment accomplished from the inside. These fixing methods have been engineered dependent on the operational conditions for each particular drum. They are designed to minimize maintenance shutdowns, increase safety of installation, and extend wear life. Thanks to the confidence placed on us by our customers, Corrosion Engineering has developed extensive experience in the lining of agglomeration drums for mining operations worldwide. Every drum we’ve lined has demonstrated superior performance in operation, and we guarantee our drum lining systems to be the most economical per processed ton on the market compared to any other lining system in the same application. Post-sales support is a fundamental part of our services at Corrosion Engineering. Our customers are attended to by our Technical Personnel who advise on proper maintenance practices to maximize the wear life of Drum Lining Systems. Customers receive a detailed maintenance booklet specifying suggested maintenance and inspection practices. Periodic inspections to determine wear patterns are important to extend the wear life of the Lining System. Custom trommels from Corrosion Engineering are equipped with durable, high-capacity trommel screen panels of various constructions and apertures that optimize screening performance with higher throughput, improved life, and increased availability.